Time to start another restoration. This one will be my Crosley 9-403M. Overall the tv is in good shape. The cabinet is in great shape except for some scratches on the side and a small piece of missing veneer in one of the top rear corners. All easily taken care of. BTW, no back. Anybody have a picture of one so I can make a back for this tv? The chassis looks like it has never been worked on underneath. No evidence of any work. Of course there were some tube changes along the way. The metal chassis has the usual plating dust all over it. Everything steel has it. A quick trip to the quarter car wash and most of it is cleaned away. Though the metal will have to be scrubbed clean. The chassis looks like it was made from galvanized steel. It appears that something has "run" on the surface of the chassis. This makes me think it's from the galvanizing process. Now the one bit of bad news. When I got this tv I did a quick check on the CRT. It checked real good! Problem was is that the 10BP4 CRT is gassy. Yup, there is a purplish glow around the inside diameter of the tube. BTW, this tube is a rebuild. I have several 10BP4's that checked good from "donor" tv's. 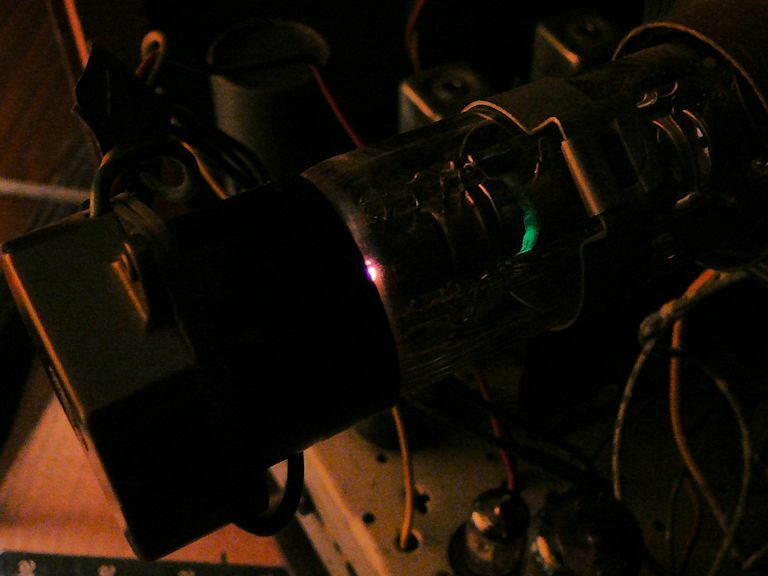 The purple glow may not be gas, if it glows on the inner surface of the glass it could be normal, same way a output tube will sometimes glow under a load, try it in a working chassis before condemning it. I agree. You may just have the ion trap out of adjustment or missing, (if it has one). Gas is usually a distinctive purple glow that's around the gun elements more than on the glass. A purply-blue color can be fluorescence on the glass, actually can be a good sign! What does the getter flash look like? Metallic-looking all over, usually a good sign. Dirty-looking grey - brown, bad sign. Cloudy at the fringes, may still be OK, but has had a little gas the getter has removed. Wax, paper, bitumen, cotton, high voltages - what could possibly go wrong? IIRC, the white tubes were also glowing purple. Here is a close up. The purple glow was also on those white tubes. The getter looked good. The cut-off worked well but the meter on my BK 467 CRT tester was pegged all the way to the right. A sign that the tube is gassy. When I have the TV up and running, I'll see what it is really like then. Purple glow on the white insulators is very bad. Tester pegs - gas is ionizing. Also bad. I'd say that whatever has happened, it's happened recently and the getter hasn't had time to react with the gas. Start looking for another tube. You say the meter is pegged, but cut-off worked well ? I'm not that familiar with the 467, but my experience has been that the cutoff control will not do anything if the CRT is gassy. Yeah, the cutoff worked great. There is definitely a purple glow especially when the ION trap magnets are moved over the area. It gets a lot brighter. I wish I could post a good video of it. The getter looks pretty good too. The base is loose so I'm wondering is an indication of where the leak started near the wires as they exit the tube. Though I've had other bases loose and tubes that weren't gassy. We'll see in a week or so when I fire this thing up. There are some tubes that have phosphors in the neck that glow to help adjust the trap, I think Phil Nelson has one? I remeber it being green but I guess it could be purple also. One thing's for sure, either you have a paperweight or a really good tube. Yeah, you're right! We'll see. I used a 1/2 inch square piece of hard maple to make a "stand" while I work on the underneath part of the chassis. I removed the tuning scales to keep them safe. I then tape some folded over paper towels to the top of the power transformer and to the top of the HV cage to protest them while inverted. I used an existing hole in the chassis and bolted on a small cross-member so the stand will stay in place. Much easier to work on when it is this way. I also use some spacers that I make up so I can grab the chassis when upright. These spacers are 1" x 1/2" with a 3/16 hole down the middle. I then use a 5/16 drill bit and counter bore a hole about 1/4 deep. Then I round the "bottom" corner to prevent it from digging into my bench top. For the hardware I use some #10 (3/16) x 1 1/2 long countersink head 10-24 bolts. I also use some 10-24 nylon lock nuts. Using my disc sander I reduce the head diameter so it'll fit into the counter bored hole. Then the spacer is bolted to the chassis. Works great and I can grab and lift the chassis much easier. Been doing this type of thing for awhile now. Works great! As my usual practice, I labeled all the tubes, resistors, capacitors, coils, inductors, and transformers according to the Sams docs. I also label all the terminal strips. There was only 1 resistor that was in the chassis that wasn't covered in the Sams. See if you can spot it in picture #2. I also found a mistake with the value with C56. Sams has it listed as a .002uf while it should be a .003uf which was installed and Riders has it listed as a .003uf. Now I'm ready to start re-stuffing the E-Caps. While I'm posting pictures I thought I would show you guys 2 capacitors that this set uses. C35 is a 4pf IF Coupling capacitor. C26 is a 2.5pf IF coupling capacitor. Nice work spotting those C26, C35 gimmicks! I don't think I've ever seen any like that. It's not the Destination, It's the Journey. There are some tubes that have phosphors in the neck that glow to help adjust the trap, I think Phil Nelson has one? I remember it being green but I guess it could be purple also. Those are the biggest gimmick capacitors I've ever seen. I'd leave 'em alone -- they are just wires -- and avoid bending them into new shapes.